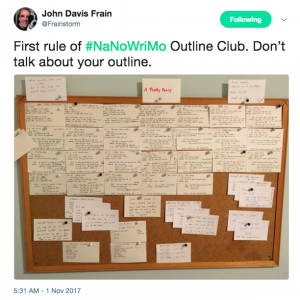 So it’s November 6th and some of my writer friends are well into #NaNoWriMo – the ‘National Novel Writing Month’ challenge that’s become popular over the last few several years. I have nothing but respect for them. If it were me attempting the challenge, where the aim is to write a 50,000 word novel in the space of 30 days, then by now, six days in, I’d be about 500 words in and nursing a mountain of guilt. 50,000 words, in 30 days, is 1,666 words per day. Not do-able for me, I’m afraid, not with the new(ish) full time job, the husband and three kidlets, the household, and everything that goes along with those commitments. 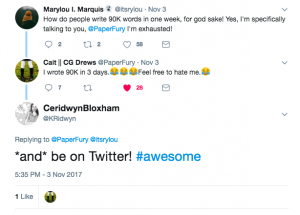 I caught a tweet just yesterday from @paperfury, who replied to a follower that she managed to write 90,000 words in three days. Now THAT’S insanely awesome – especially considering that she’s also on twitter. Like, ALL THE TIME. Anyway, back to #NaNo. No, I’m not, and have never, attempted it. But that’s not saying that I shan’t, at some point in time in the future. Perhaps when I get good enough to stop being a pantser, and be a plotter like @Frainstorm – check this out, below! Anyway, just some random writerly-type thoughts for the beginning of the new week.